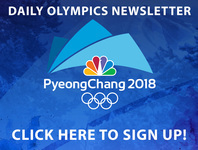 NEW YORK (AP) — While gold medals aren't awarded a quarter of the way into a race, NBC says it is encouraged by how the viewing public has responded to the Winter Olympics from South Korea. NBC Sports Chairman Mark Lazarus said Tuesday that ratings are exceeding the guarantees that NBC gave to its advertisers which has enabled the network to sell even more commercial time. NBC said before the games it had sold $900 million worth of advertising. Through five days, the Nielsen company said NBC's prime-time Olympics viewership is down 6 percent from the 2014 games in Sochi. This year's numbers include prime-time programming on the NBCSN cable network and digital streaming, which adds about 2 million viewers each night to the 22 million who watch on the broadcast network. Those extra options weren't available four years ago. "The Olympics continue to defy media gravity," Lazarus said. While the viewership is down, it hasn't dropped as much as the conventional television audience. For example, the 10 most popular programs on TV this season average 11.2 million, or 22 percent lower than the 14.26 million for the most popular programs in 2013-14, the Nielsen company said. None of the shows popular four years ago that are still on the air — "The Big Bang Theory," ''NCIS," ''60 Minutes," ''The Voice" and "Blue Bloods" — have a larger audience today. While Lazarus offered no specifics, he said viewing in some other parts of the day is actually up from Sochi. Adam Schwartz, an analyst for the ad buying firm Horizon Media, said he's been pleasantly surprised by the early ratings. "I definitely think they've exceeded expectations given the current climate," Schwartz said. A network generally holds back commercial time for "make goods" in case the ratings don't hit a confidential target promised to advertisers. That means the advertisers get extra time for free. Since the ratings have exceeded the target — Lazarus wouldn't reveal what it is — so far "make goods" won't be necessary and NBC can take some of that time set aside and sell it. NBC has said it expects to make money on the games, for which it paid a $963 million rights fee. Extra advertising money can only help that bottom line. Lazarus said it's encouraging that the prime-time ratings have remained consistent even without many marquee performers. NBC has heavily promoted skier Mikaela Shiffrin, for example, but weather cancellations have kept her off the air. Snowboarder Shaun White appeared Monday night, but not until 11:30 p.m. on the East Coast. To Lazarus, the consistency in audience level indicates that people are turning in for the event more than for personalities. He predicted that by the time the Olympic flame is doused, Pyeongchang will get more media consumption than any other winter games. NBC says it has also been helped by showing its evening coverage simultaneously across the country — meaning its 8 p.m. prime-time coverage on the East Coast begins at 5 p.m. out West. Because of the time change, that means extra prime-time coverage out West, which is often filled with live events.